For Chicago in 1893, the Columbian Exposition was the right world’s fair, in the right place, at the right time. Occurring only two decades after the Great Fire that ravaged the city’s center, it was an opportunity to show off to the world Chicago’s recovery and exponential growth. This was done, mind you, in little more than two years, into the teeth of a widening recession that was particularly gripping our nation’s agricultural regions and silver-mining centers such as the young state of Colorado. In this light, fifty cents’ admission was steep for many visitors, but in its six months of public existence the fair counted twenty-seven million admissions. There were fourteen major buildings clustered around the park’s central lagoon. The Manufactures and Liberal Arts Building was so large that during dedication ceremonies it sheltered more than 140,000 people, with room to spare. Besides scientific exhibits from around the United States and the world, one could marvel at the successful logistics deployed to host many thousands each day, including water treatment, waste disposal and the ability to feed 60,000 people at one time. While St. Louis has long claimed to be the “Gateway to the West,” the participation of former “frontier” states like Colorado helped underline Chicago’s historic and continuing role in the development of the West. Harsh economics at first seemed to undermine Colorado’s ambitious plans for its own displays, but the last-minute contributions of wealthy citizens rescued them at the eleventh hour, a special case of many similar efforts on behalf of other exhibitors. There had also been some skepticism about charging an additional twenty-five cents admission to Colorado’s Cliff Dwellers exhibit, a constructed “mountain” housing a representative canyon, paintings of stunning ruins and a museum featuring relics of long-gone Indians. It turned out to be one of the fair’s most popular exhibits. Interestingly, the otherwise ambitious fair authorities declined to partner up with legendary scout William F. “Buffalo Bill” Cody for an incarnation of his famous Wild West Show. So he contracted for fifteen adjoining acres and as a result earned one-million dollars in profits. At the same time, they offer a highly readable overview of the fair, including a well-selected collection of photographs. Many of these are panoramic views of awesome architecture in designed settings. But one image I keeping turning to is a photograph of the famous sharpshooter Annie Oakley at the entrance to her dressing tent. 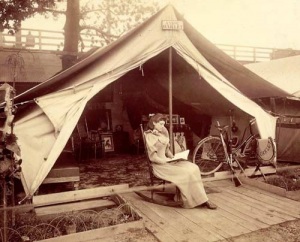 The tent flaps are open, displaying for all to see personal possessions such as her dressing table, banjo, rifle and even a bicycle.